A photo taken Jan. 9, 2017, shows the locked gate and a historic marker at the now-abandoned A.G. Gaston Motel in Birmingham, Alabama. Once used by the Rev. Martin Luther King Jr., the motel will be renovated as the city's civil rights district joins the National Park Service. President Barack Obama signed an order Thursday designating an historic civil rights district in Alabama as a national monument, placing several blocks of a city once rocked by racial violence on par with landmarks including the Grand Canyon. The National Park Service will now have oversight of a downtown section of Birmingham, Alabama — a focal point of civil rights struggles in 1963 against harsh enforcement of laws mandating racial segregation. Obama, who leaves office next week after serving eight years as the nation's first African-American president, acted after Congress failed to approve legislation proposed to bring the several-block area into the federal park system. “It is such a great tribute to the people of the city of Birmingham that President Obama would make this designation as one of his last actions before leaving the White House,” said Rep. Terri Sewell, D-Birmingham, who sponsored the legislation. Agency employees will now be based in the district, which also becomes eligible for federal funding. The Park Service separately announced grants totaling more than $500,000 benefit the area, part of $7.5 million in funding for civil rights sites nationwide. The Birmingham Civil Rights National Monument will include the now-abandoned A.G. Gaston Motel, where the Rev. Martin Luther King Jr. planned weeks of demonstrations against segregation in the spring of 1963; the park where black protesters were met by police dogs and fire hoses; the 16th Street Baptist Church, where four black girls died in a Ku Klux Klan bombing that year; and the Birmingham Civil Rights Institute. It also includes a business district that was a hub of black commerce for generations. The Rev. 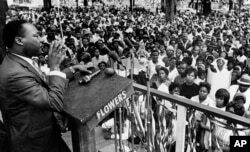 Martin Luther King Jr. addresses a crowd of some 3,000 persons, April 30, 1966, in Kelly Ingram Park on the last day of his three-day whistle-stop tour of Alabama, encouraging black voters to vote as a bloc in the primary election. Obama also designated two other new national monuments linked to equal rights. The new Freedom Riders National Monument in the east Alabama city of Anniston will include the Greyhound bus station where a racially integrated bus of activists was attacked in 1961. The Reconstruction Era National Monument in Beaufort County, South Carolina, will tell the story of a community built by freed slaves after the Civil War. “These new national monuments provide a place for reflection on how far we've come and how far we still have to go to achieve true equality for all,” she said in a statement. The city-owned Civil Rights Institute and park already draw thousands of visitors annually, and 16th Street Baptist is both a civil rights landmark and the home of an active congregation. Local leaders and tourism officials hope that even more visitors will show up once the site has National Park Service employees to greet visitors and explain the sites. 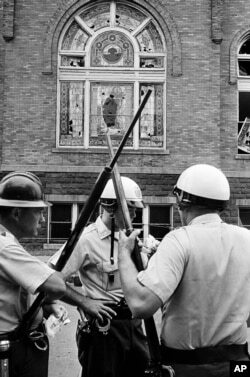 The most visible changes will occur at the now-ramshackle motel where King met with aides in an upstairs suite called the “war room” during pivotal demonstrations that resulted in Birmingham police and firefighters trying to stop marchers with dogs and high-pressure water hoses. King himself was arrested and wrote his famous “Letter from Birmingham Jail” while in the city in April 1963. The city, which owns the motel, plans to renovate it as part of a $10 million project. Built in 1954 by black businessman A.G. Gaston at a time when blacks couldn't stay in the same hotels as whites, the Gaston Motel once provided luxury accommodations to black travelers. Guests included singers Aretha Franklin, Harry Belafonte and Nat “King” Cole. When King came to Birmingham to help guide demonstrations in early 1963, the motel was a natural base for operations, located just a block from 16th Street Baptist. Segregation laws were eventually overturned, and the motel later closed and fell into its present state of disrepair. Renovations will include restoring the King room to the way it appeared in 1963. In addition to being staffed by park rangers and becoming eligible for funding, being a national monument means the area will receive federal assistance with marketing, programming and maintenance. Aside from the Grand Canyon, other national monuments include the Petrified Forest in Arizona; Muir Woods in California; and New York's Stonewall Inn, where the modern movement for gay rights began in 1969. Policeman stand guard outside the 16th Street Baptist Church in Birmingham, Ala., which was the scene of an explosion that killed four African American children, Sept. 15, 1963.